The Institute for Marine Mammal Studies (IMMS), recovered the dolphin on April 30th and placed the animal in their freezer until a thorough necropsy could be conducted. It was during necropsy that the gunshot wound was discovered. A small caliber bullet was found lodged in the dolphin's lung and proved to be the cause of death. 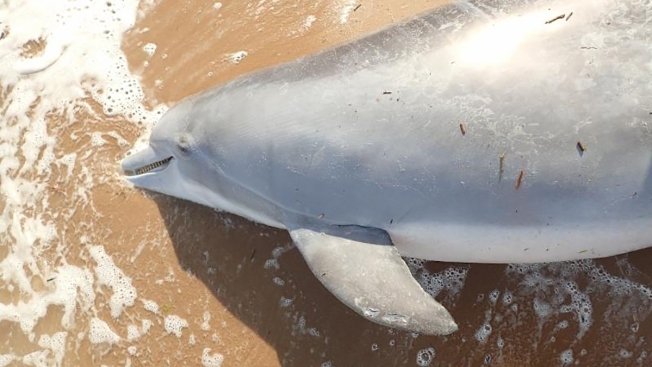 Officials are offering a reward of $11,500 as they seek the person who shot and killed a pregnant bottlenose dolphin found on a beach in Waveland, Mississippi. The Institute for Marine Mammal Studies recovered the dolphin at the end of April and stored it in the freezer until examiners could conduct a full necropsy, or animal autopsy. Examiners discovered a gunshot wound and small caliber bullet. They concluded that the bullet pierced the dolphin’s lung, killing both the mother and her unborn calf, according to a statement released Monday by the National Oceanic and Atmospheric Association (NOAA). Since 2002, at least 24 dolphins have washed up "with evidence of being shot by guns or arrows, or impaled with objects," reflecting an increase in violent incidents toward dolphins in the Northern Gulf region that may be hastening, as 68 percent of those events have occurred in the past eight years, according to NOAA. To help prevent further such acts, NOAA said people who encounter dolphins should never try to feed them, as this can condition the animals to “approach people, boats, and fishing gear looking for food,” putting themselves in potentially dangerous situations. "They can learn to approach fishing gear and to teach this behavior to their young," NOAA said, pointing to some cases that "resulted in violence toward dolphins by fishermen frustrated by the loss of their catch." Killing, harming and feeding wild dolphins were outlawed in 1972 under the Marine Mammal Protection Act. The reward is being offered for information leading to the identification or arrest of the person or people responsible. Anyone with details about the incident is asked to call the NOAA Enforcement Hotline at 1-800-853-1964 or the Slidell, LA, Enforcement Field Office at 985-643-6232.